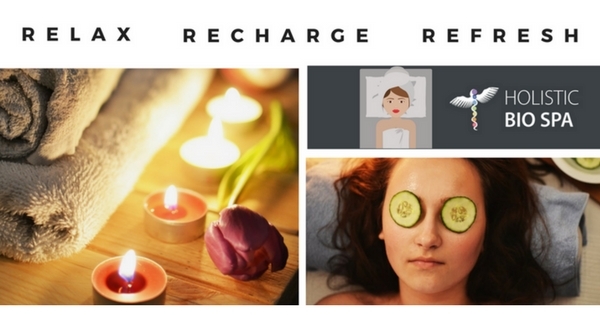 Holistic Bio Spa is excited to have our dear Jaqui Karr back to tell us everything she knows about how to get rid of stress with the best holistic treatments and to avoid sickness. Autoimmune diseases affect 78% of women versus only 22% men. Is that something? That’s insane! And I’ll tell you why it happens in one word: stress! Think about it: when a break up happens, what do men do? Go for a beer with their buddy, watch a game, look for their next girlfriend. And what do women do? Yeah, I know… I would need 44 pages to list all the stuff we do. So all I’m going to point out is that we don’t simply forget it and move on. 1. Don’t try to find the answer to everything. You don’t have the years! Not to mention the job of “god” is taken. Your job is to just live your life in the most pleasurable way possible. Don’t try to solve all the mysteries and figure out why “he did that” or “she said that” or “the boss doesn’t appreciate anything”. They did, they didn’t, they never will. Their actions are theirs to own, not yours to solve. Move on. You hear it a lot, just like you hear “you should drink a lot of water”, but you don’t do it. Let’s all start doing it (both breathing better and drinking more water). When something bothers you: stop, take a huge deep breath, and ask “Will this matter in 10 years?” Then keep taking long deep breaths. Just s-l-o-w your brain down. Hmm. Suddenly the “big problem” is a minor annoyance and not worth your time. “A spa day is always a good idea”. …Stress embeds itself into body tissue. No good. You don’t want the wrong stuff embedded anywhere in or on you. It’s like carrying around a really bad tattoo. A skilled massage therapist (like Addy at Holistic Bio Spa) knows how to get into your sympathetic nervous system and release all that stress. Just like food and air toxins get into your body and need to regularly be cleaned out, so does stress! 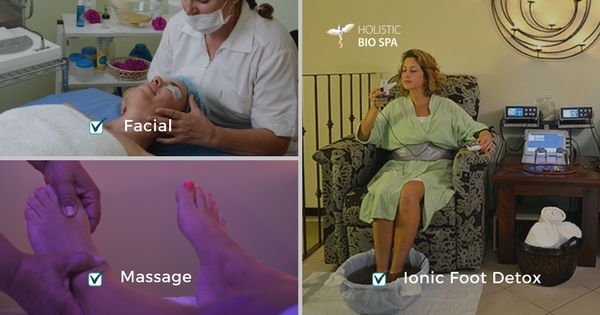 Speaking of food and air toxins, get a foot detox bath while you’re there. It’s like dusting the house, you have to do it regularly. Plus, I find an hour of massage isn’t enough. I don’t decompress completely in just an hour. So I like to start with a foot detox bath, at the end of which I feel calm and distant from my regular life – and then I go into a massage. It’s such a superior experience. That’s what got us into that 78% to begin with! We’re really good at beating ourselves up about every little thing. It’s a bad habit and we all need to break it. Come on Chicas! We can do better. Commit right now: let’s make a sister pact that we will all take better care of ourselves. This isn’t just about feeling good for a day. This is about avoiding the serious illnesses that hit when you go through chronic stress. That’s really what an autoimmune disease is: it’s your body way over-taxed and it snaps like an elastic and breaks. So it’s up to you to do something before it breaks. You have to help lighten the burden. When they say “stress kills”, they’re not kidding.